A long time ago when there is no computers/internet, people write a message on paper and send to their friends with mail. Next generation starts to send an SMS to their friends phone. And nowadays people wish a happy birthday with social networks ( most popular is Facebook ). 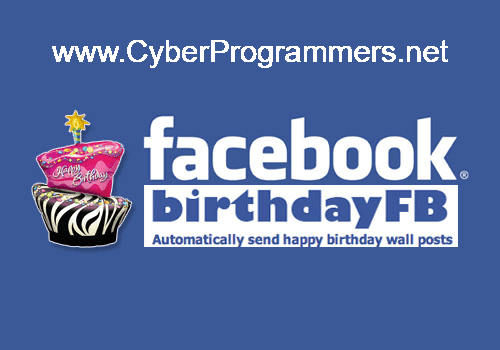 In this post, I will show you how to schedule and auto post birthday wishes to your friends Facebook wall. We don't need to download any software, it's easier. 1) First of all open this website. 2) Click on "Connect with Facebook" button. 3) After you need to allow the app for permissions just by clicking on "Allow" button. 4) After at top of that website you can see "Write a Message" tab, click on it. 5) You can choose one of the templates to save your time and after its ready you need to press the "save" button. Now your friend will receive your wishes on his timeline. If you want to cancel the scheduled wish you need to go to "Scheduled Messages" tab at the top. And you can see the feature remove the scheduled wish.